HomeSeeMovies‘KODACHROME’ EXALTS THE TANGIBLE IN AN ERA OF DIGITAL DUST. The following movie review is reprinted with permission by fellow Charlotte Geek and local movie reviewer, Douglas Davidson. To read more of his movie reviews, please visit his website Elements of Madness. There’s a common misconception that if a movie premieres on Netflix it’s somehow not worthy of a theater run; as though only films shown in a cinema house are somehow the only ones worthy of an audience. If films like I Don’t Want To Live In This World Anymore, Okja, and Mudbound haven’t make it clear – Netflix comes to play. They recognize that cinema isn’t for just one demographic, but for all peoples. As a digital service, they have the ability to reach untold audiences with a simple click. 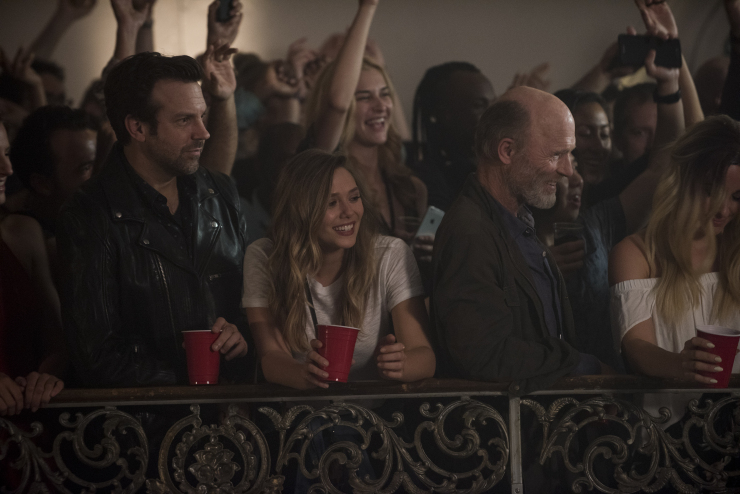 It’s rather ironic then that their latest original film, the Mark Raso-directed Kodachrome, focuses heavily on man’s relationship with art and the way futurist progression breaks down what makes art worth enjoying – the perception of tangibility. Music label rep Matt Ryder (Jason Sudeikis) is having a rough day. 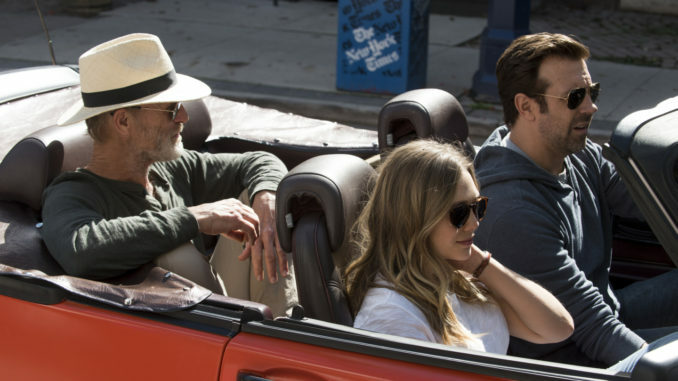 First, his prize headlining artist dumps him, his boss threatens to fire him, and then a strange women (Elizabeth Olsen) arrives in his office with a message from Ben (Ed Harris), his decade-long estranged father – he’s dying and wants Matt to accompany him on a cross-country journey to Parsons, Kansas, the home of the last photo shop using Kodachrome to develop photos. At first reluctant, Matt joins the road trip when he learns that he can stop to court another band along the way which might just save his job. With each man getting something out of the trip, the tumultuous journey from New York to Kansas begins as each race to preserve their legacy through the craft they love above all else. L-R: Benjamin and Matt Ryder chat (Ed Harris and Jason Sudeikis). Most films indulge some form of MacGuffin in order to move the plot along, yet Kodachrome’s is far more than the standard plot device. Inspired by the Dec. 2010 New York Times article For Kodachrome Fans, Road Ends at Photo Lab in Kansas by A. G. Sulzberger, script writer Jonathan Tropper (This Is Where I Leave You) clearly recognized that the artists using Kodachrome processing in their work felt a deep loss when Kodak halted production. Though viewed by many as an outmoded process in the wake of digital technology, the palatable grief of its users correlates nicely with a tale of two men facing similar fates, infusing the real story with a fictional premise of familial discord. One, a famous photographer (Ben) facing his final days, quests to process several rolls of his earliest work for a gallery showing, while the other, his son, a progression of his own legacy, a music lover whose analog tastes can’t keep up with digital trends, just wants to stay in the game. The last photo shop using Kodachrome in its processing may incite Ben to take his cross-country trip, but it’s by no-means a meaningless device. Thematically, Kodachrome is as essential as the journey of these men to tell the story. Casual viewers will be surprised to discover that Kodachrome is substantially layered in themes ranging from man’s struggle to stay relevant, the undeniable process of nature to remove outdated technology, and the need to feel loved. Raso’s work suggests a filmmaker far beyond his two-feature-film experience. Each shot is purposeful and heavy with meaning. In one scene, the camera lingers on Harris’s face for a prolonged period, enabling the audience to take in every line, every wrinkle on the brilliant artist whose caustic disposition pushed his son away. A shot like this requires patience on the filmmaker and asks the same of the audience. Just as a photographer presents still-life in the moment, Raso wants us to take the time to absorb the man Ben’s become. Later, as Matt goes through the slides produced during their visit to Dwayne’s Photo in Parsons, Raso largely shies away from showing the audience the photos, selecting instead to focus on Matt’s reaction to the images. Slowly, so slowly, we observe Matt’s face change from stoicism to awe, overcome with the moments his father captured on these forgotten rolls of film. In these moments where Raso diligently and delicately holds the camera on his subject, Kodachrome hits you right in the gut. At one point Ben states that photographers are “preservationists” who make “human nature more tangible.” Thinking in a similar way, Raso uses the camera to hold tight on the moments that matter, empowering his actors to give their all as the audience absorbs even the slightest changes in visage and demeanor. Elizabeth Olsen as Zooey Kern standing between Matt and Ben at a concert. 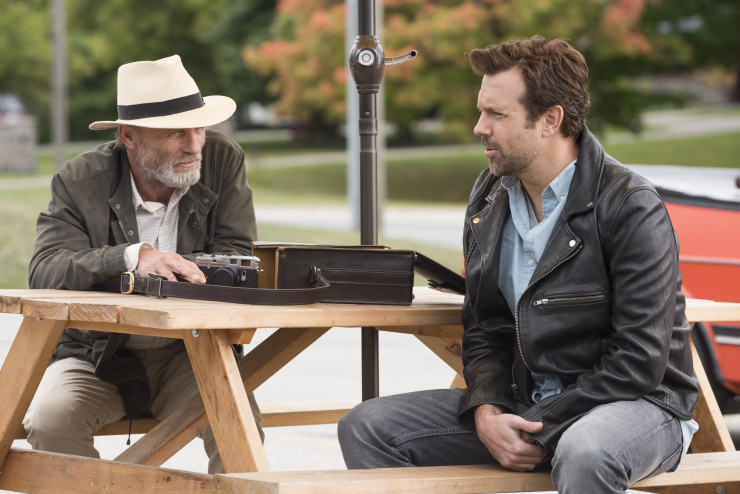 If nothing else, Kodachrome should finally put to rest the versatility of Sudeikis as a leading man. He’s been a monster in Colossal, ne’er-do-well in We’re The Millers, and a strong comedic performer for thirteen years on Saturday Night Live, but never has he turned in a performance so deeply rich, so nuanced, and so perfectly matched for his brand of quippy snark. Matching him beat-for-beat, Harris is magnetic as Ben, a man well aware that his abrasive tendencies keep everyone that should mean something to him at arm’s length. Played by any other actor, Ben’s an irredeemable figure, yet Harris not only offers a glimpse of hope, but – in bouncing off Sudeikis – suggests a man whose awareness extends to a hidden shame. The entertainment derived from watching these two go barb for barb is not only a testament to the actors, but also to Tropper’s script as these men slowly reveal themselves to be mirrors of one another. Holding her own between the two is Elizabeth Olsen (Avengers: Civil War) as Zooey, a character that frequently feels more like an exposition device than a proper character. Yet what we glean from her, and in the manner we glean it, makes her journey just as important as that of Matt and Ben. Even with such a small central cast, Raso and Tropper balance the narrative so that each actor is given relevance beyond a single action or decision. Whether you catch Kodachrome on Netflix or at one of the festivals it’s playing throughout the country, it is a film not to be missed. It’s depth of humor and melancholy will surprise audiences in a myriad of ways. Using the backdrop of technological obsolesce as the driving force within the story, Raso and Tropper craft a grounded narrative of two men in crisis whose journey doesn’t so much repair them, as offers bittersweet closure. Replete with fantastic performances from a top tier cast, Raso’s enthralling direction, and Tropper’s meticulous and captivating script, Kodachrome is a highlight picture of 2018.